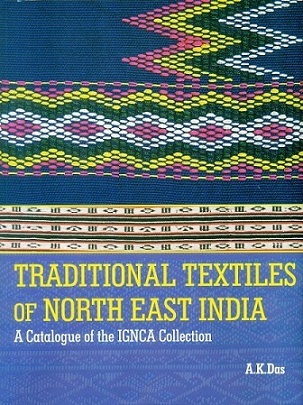 This catalogue presents traditional textiles of various ethnic groups of the North East India. All these selected materials incorporated in this catalogue are fine specimens of tribal textiles preserved in the cultural Achieves of the Janapada Sampada Division of the Indira Gandhi National Centre for the arts, New Delhi. These materials were meticulously collected and documented by the researchers of the IGNCA acquired from different ethnic groups of the North Eastern States. Some of the materials presented here are endangered and are on the verge of extinction. This catalogue not only presents a repertoire of tribal costumes and apparels but also comprehensive account of land, people and culture of the region. This will help researchers in their effort to investigate further in the realm of traditional textiles and its social milieu. A selected number of textiles pieces are duly illustrated with high resolution photographs. A number of photographs depict the ecology and day to day life of the people of North East India. This catalogue also incorporates all the textile pieces of the IGNCA cultural archives with full ethnographic details India. This book will be useful for all those who are interested in the traditional life and culture of the ethnic population of North East India.